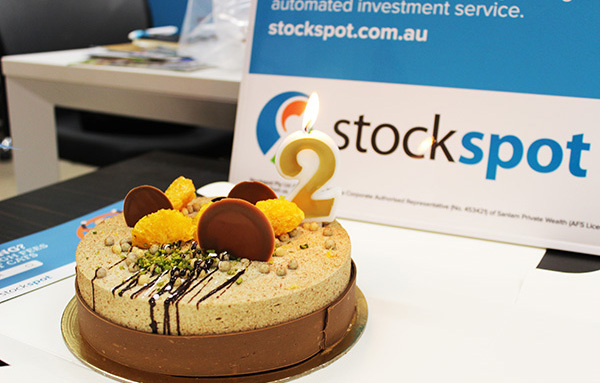 Thanks to the thousands of clients who have been on the journey with us since Stockspot launched to the public in May 2014, exactly 2 years ago. Back in 2014, automated investing, robo advice and fintech weren’t as well understood as they are today so we appreciate the support of our clients who have trusted us to help manage their savings. Despite the recent share market volatility, the Stockspot model portfolios generated 4% to 4.5% p.a. in total returns over the 2 years to 30th April 2016. The performance was more than double the 1.5% p.a. return from indexed Australian shares over the same period. Distributions and dividends made up most of the performance since it was a subdued period for capital returns. Total return p.a. Distributions p.a. Our allocation to defensive assets helped to negate weaker share returns, with bonds returning 5.7% p.a. and gold generating 7.9% p.a. At its widest margin on January 4th 2016, the Stockspot model portfolios had outperformed broad Australian shares by 14% over the 2 years. This demonstrates why asset allocation is significantly more important than picking stocks. We continue to see bonds and gold as being excellent portfolio diversifiers. By individually tailoring our investment advice, we’ve helped to ensure our clients have been invested in the right strategy based on their investment timeframe, goals and risk profile. This has prevented clients from taking on too much risk or selling for the wrong reasons when markets fall. 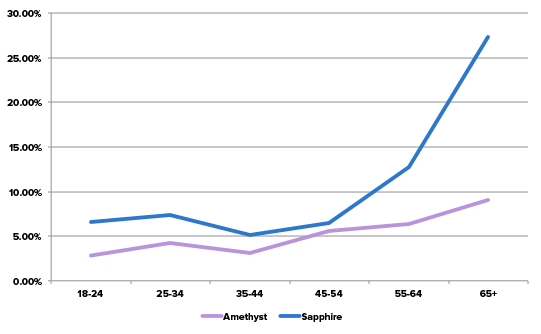 A larger proportion of our clients in their 50s to 80s are invested in the more conservative Amethyst and Sapphire strategies that have historically demonstrated lower risk. On the other hand, 75% of clients who are looking to invest for 7 years or more have invested in one of the more aggressive strategies (Topaz and Emerald). 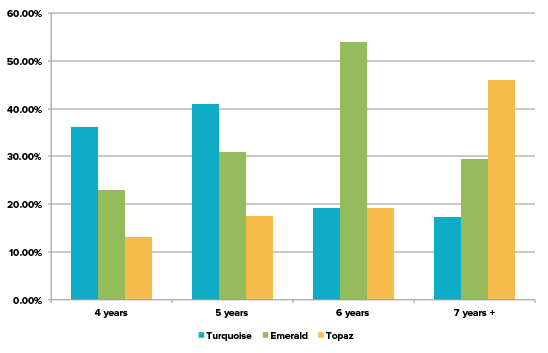 The Turquoise strategy has been most popular for those planning to invest for 4 or 5 years. We ask all clients to keep their investment profiles up-to-date as this helps to ensure that our advice stays consistent with their changing circumstances and life goals. Stockspot become the first robo-adviser in the world to give clients the flexibility to personalise their portfolio with the launch of Stockspot Themes. We have seen strong demand from clients wanting to increase their allocation to global investments, with US shares and global bonds being the 2 most popular themes so far. While we avoid trying to predict short-term returns, it would not surprise us if Australian shares enjoyed better performance over the next 2 years. We’ve spoken before about how assets tend to mean-revert over the medium-term and since Australian shares have underperformed since 2010, they could be due for a rebound. The low and falling cash interest rate could offer additional support for shares since Australians will have little incentive to leave their money in the bank with interest rates below 2%. 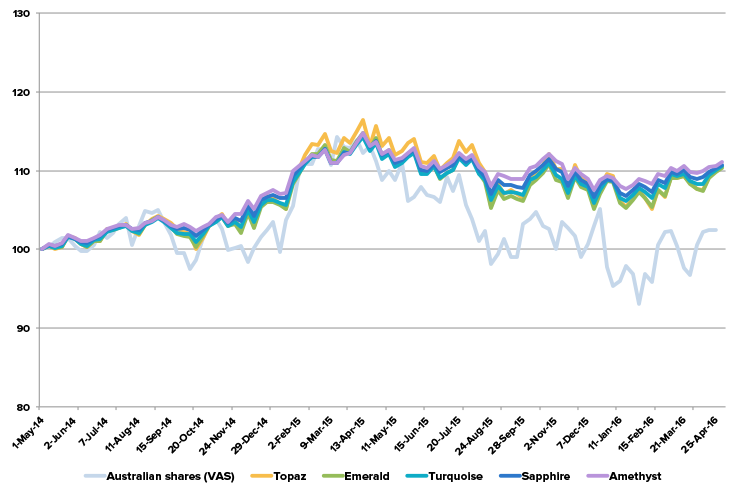 If this were to happen, we would see a greater difference between the performance of the portfolios, since Topaz and Emerald have a higher allocation to Australian shares. All of the Stockspot model portfolios generated similar returns (4% to 4.5% p.a.) 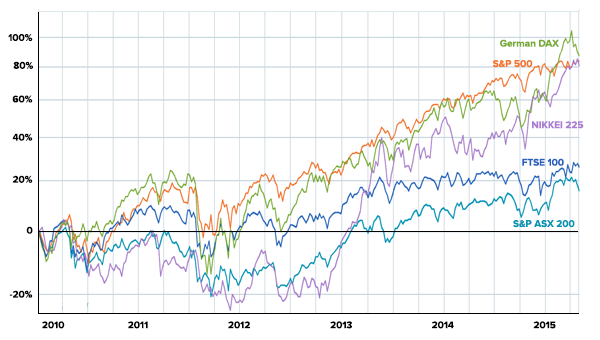 between 2014-2016 but over the long term we expect those with a higher allocation to Australian shares to outperform.